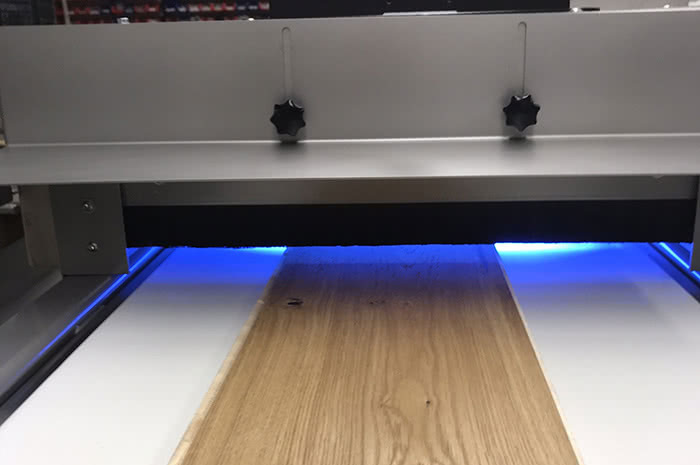 The Innovative LED + X dryer from "Wirth"
As an extension of our machine program, we have picked up on customer requests together with the well-known paint manufacturer Saicos and developed a NEW LED + X drying system. So far, LED hardened oil surfaces have not been competitive in properties with oxidative, hybrid or UV-oiled surfaces. The interplay of the newly developed formula and pioneering technology in the lighting segment now leads to a result that is of high quality, energy-efficient and durable. Mounted on a conveyor belt with a length of 2000 mm.